I completed this early last month but didn’t have a chance to take photos until today. Sorry it’s a bit dark! 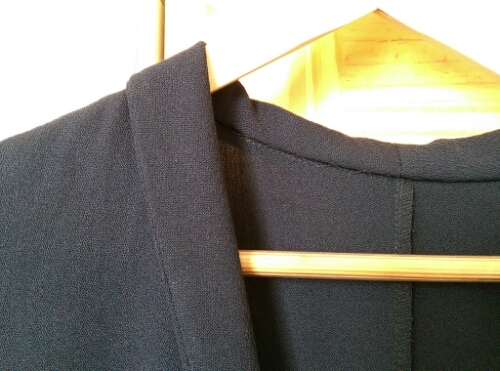 The dress is a very dark navy wool crepe. It’s the Dakota dress from the Finnish company, Named Patterns. I’ll confess, I was blown away by their first pattern collection last winter. I really hesitated in committing to making up any design, though, because they are so fashion-forward and I didn’t know if it would suit me. Thank God for the internet! Seeing many reviews convinced me it was worth a go. So, the dress! 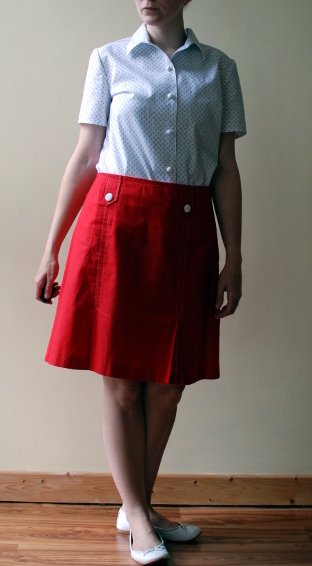 It has many panels and a shirt-like hem on the skirt, making it really swingy and comfortable. It also has a shawl collar. Since it’s meant to have something worn underneath, I didn’t bother over fitting the sleeves. I made an error when joining the bodice pieces. Unfortunately this was after I overlocked the whole thing so the bodice ended up a touch snugger than intended. 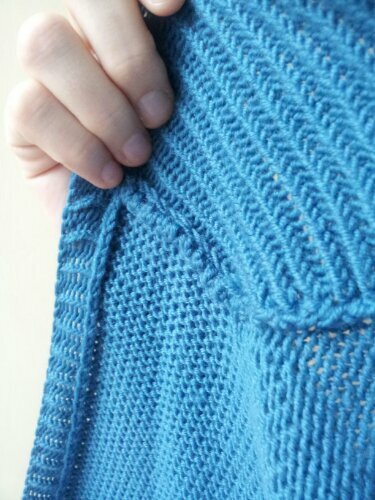 It’s still possible to get into without any kind of closure, which is great, and I can only imagine how comfortable this would be in a heavy knit. And the blouse? Also from Named! 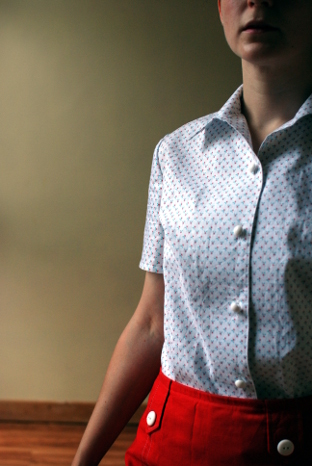 It’s the Fran blouse – an unusual item with kimono/batwing sleeves and a long bow. I got the fabric in Japan and figured I’d get much more use out if it as a blouse! I’m excited to have used it already. 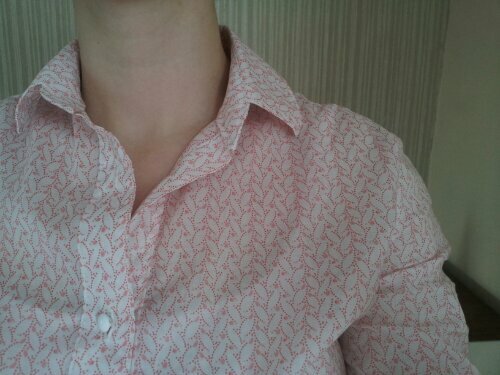 The only difficult part about the blouse was tracing the pattern from the print out. With the sleeve combined, it’s sort of an awkward shape. This is mostly on me, though, because I don’t have big paper right now. Anyway! I love this blouse. You can see how much room there is under the arm. I thought that might be annoying but it’s not. I think this style works because it is well fitted everywhere else. 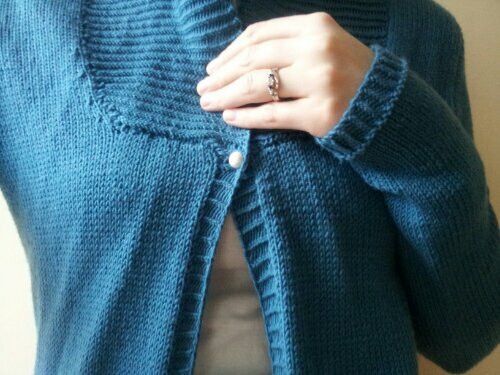 It was a really quick make, mostly because you have the option to just turn under the fronts to make the button bands. They do provide extra pattern pieces in case you don’t want to do that. My only error was not giving a little extra room at the hips. You can see is a bit pulled at the back. However, this is only an issue when I’m wearing it out over something fairly bulky – over tights or leggings, it’s fine and I probably well never wear it like that anyway. I prefer it to be pretty fitted through the waist for tucking in. Look how long the ties are! I had to look up a video to see how to tie them properly! Since this was my first time using this company’s patterns, here are a few thoughts. Firstly, I personally like how paper economic their PDF patterns are. They overlap the pieces and you trace it off. Some people don’t like that. I’m not a huge fan of how you only get 2 sizes nested per file because if you’re between two sizes that are in two different files, I don’t even know how you would get around that. Thankfully I don’t have that problem right now. I think they’re fairly pricey but they’re impeccably drafted and the instructions are excellent. Add on top of that the unique design and aesthetic and basically, you get what you pay for. Between these two designs that I’ve made up, the only thing I take umbrage with is their sleeve opening finish. It’s rubbish. They have you make the slit and sew down an unfinished edge. I cut plackets and finished them properly. On the Fran blouse, they have you use the unfinished seam as the opening. 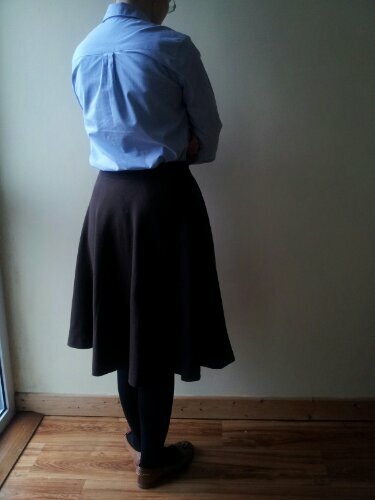 Because I french seamed the lot, that wasn’t practical so I finished that seam as normal. 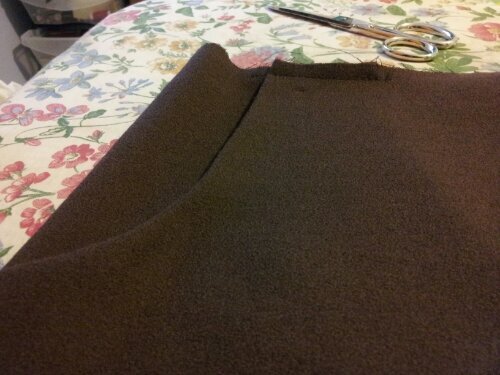 Then, I cut a separate slit and moved the pleat. 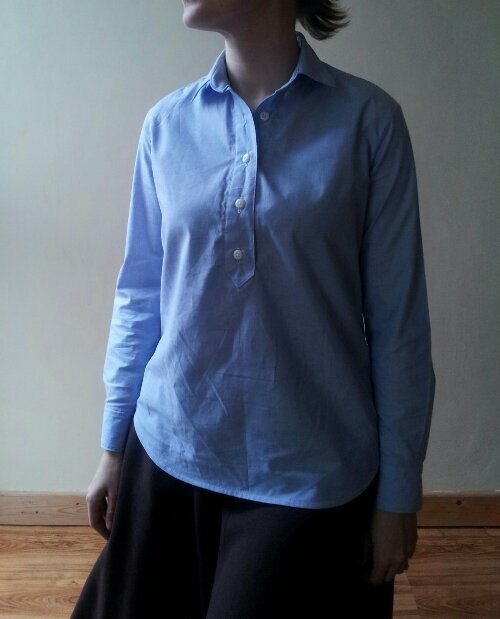 I finished the slit with the placket and sewed the little cuff on then. A little more time consuming but it will survive the wash better! If you’d like to give these a go, they’re currently on sale for Midsummer! 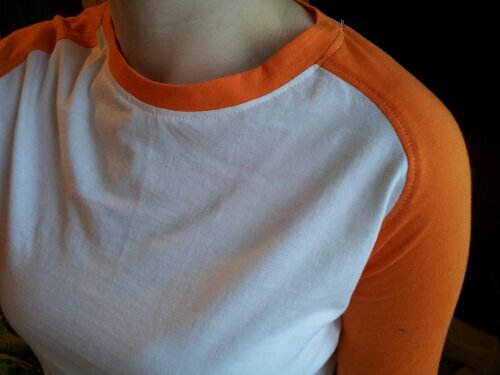 ‘Monkey top’ is our household name for a raglan two-tone t-shirt. A long time ago, Alb had a top that had dark brown sleeves and a light brown body. I joked that it made him look like a monkey, since that seems to be the standard cartoon colouration of a monkey – brown arms and light brown body. All joking aside, he has pretty good shoulders (read: pointier than a knife) so it’s a style he prefers. I like it too, but it is really hard for it to look good on a woman. My shoulders are nothing more than where my arm meets my body and a raglan sleeve does nothing to enhance that. I really wanted a two-tone top to match my green Moss skirt and the more I thought about it, the more I realised that the style needed to be raglan. What to do? For a start, once I went searching I realised the dearth of good raglan patterns out there for women. 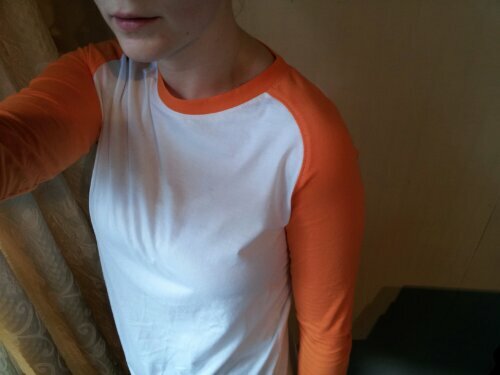 I found this Burda pattern for raglan tops with a nice array of options but eventually I came to the conclusion that it’s more respectable-woman-with-shoulders than clinging-to-my-teens which, to be blunt with myself, is more the look I’m after. It made sense, then, that I found the perfect pattern in what is essentially a tweens pattern. Browsing the Girl Charlee site (very popular for knit fabrics but based in the US so I don’t bother ordering what with customs etc etc), I found that they have a large pattern selection, most of which are downloadable. I dithered for weeks over the Curved Patrick Raglan but eventually bought it. What I did was cut the largest girls size for the top part and largest boys size for the chest and length. After some thought, I added an extra 1/4″ to each seam for the body, increasing the finished width from 34″ to 35″. I adapted the sleeves, which comes in two pieces – short sleeve with additional ‘undersleeve’ extra, and just joined the undersleeve to the short sleeve. To this, I added an extra 1.5″ because I have long arms. I cut the largest girls size for the whole sleeve but if (probably when) I make it again, I’ll use the largest boys size for the width. I was skeptical about the neckband but it turned out great. On the whole, it’s a good pattern. It’s a little pricey but considering that if you have kids, you do get a lot of sizes. I’m assuming most people buying it are not hijacking the largest kid’s size for themselves. I should have said, the fabric is from Land of Oh Etsy shop. They’re based in Korea. Reasonable prices, fast shipping, highly recommended. 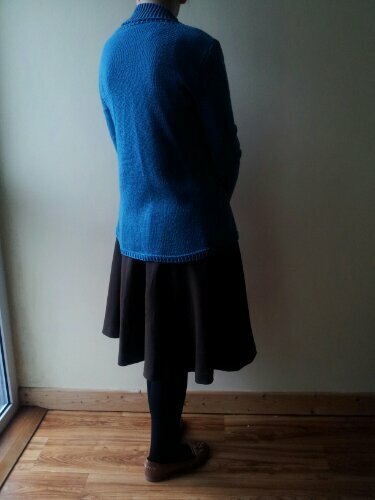 I used their cotton interlock which is soft but not too stretchy. So, the see through. I’ve been working on a silk chiffon top. I used Deer & Doe’s Blouse Airelle as my base, turning the V-neck into a round one and adding a big long neck scarf to tie into a bow. Sounds good, right? It is completely transparent. I mean, it’s lovely and the scarf-bow thing is really snug, but I might as well be wearing an invisible blouse. Usually I just wear a tank top or vest under these kind of things but I feel very undressed in this. It never occurred to me to underline it as I did not think it was quite so sheer. I’ve been thinking about it all morning and my conclusion is that I should underline it. Thankfully, I sewed on that whole scarf bit by hand, so it will be easy to unpick and resew without damaging the fabric. In such a situation, I’m tempted to think, God, I should have just bought the one I saw in Dunnes… but I know that in the end, this will be nicer and last much, much longer. I found the crinkle silk chiffon in Hickey’s Henry St and they still have some if you, too, want to embark on a three month long, french seamed, invisible elephant. Lastly, I need your opinion, people. I want to make a winter coat. A basic, every-day coat. I’ve never made a coat before so I just want to keep it simple. 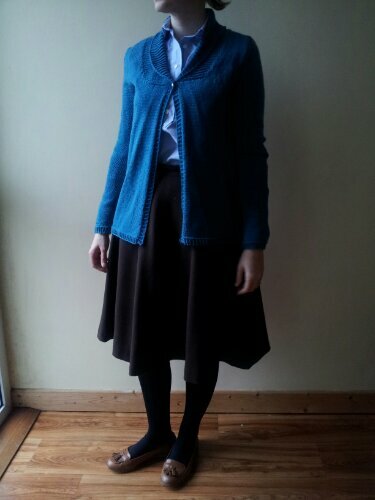 My musts are: navy, plaid lining, outside and inside pockets, knee length. No need for a hood. I acquired the most amazing navy wool melton (a really tightly-woven wool, more like a felt, traditionally used for sailor’s jackets!) 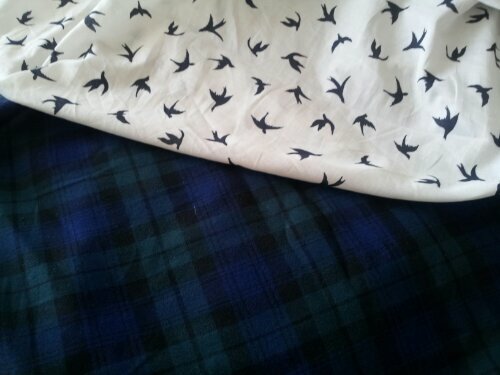 and a matching navy/white plaid cotton to line it with. My first thoughts were to make a duffle coat but now I’m considering the Veste Pavot from Deer & Doe. I think a duffle would be great if I tended towards regular rambles through undergrowth or seaside adventures, not to mention satisfying my inner Enid Blyton. However considering that the main things I do are cycle to various works, cycle to town, walk about in town, walk about in supermarket, maybe something smarter would be a better use of my fabulous melton. Thoughts? Time passes quickly being back at school! All goes well. I have tidied up a few things so I have the same number of hours but less travelling, and an extra day in my main school. I have been working on a few things but I’m forgetful about taking photos! I have almost completed my October outfit so here are a few hints until I get it finished up. silk and cotton lawn that I couldn’t resist getting stuck into. 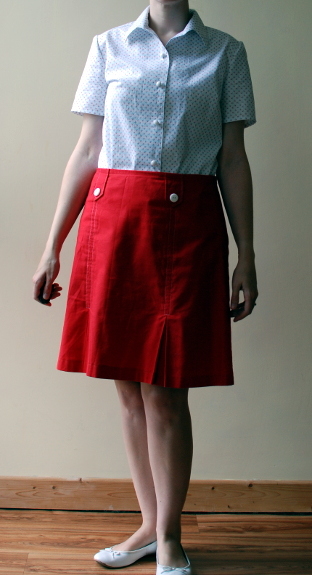 A brown wool crepe skirt that has the texture of a loaf of bread (in a good way?). I’ll talk about the patterns when I show the outfit. The fabrics are part of a package I ordered from Truro Fabrics in England. I picked them because they have a great selection, pretty good prices, reasonable delivery if I use my Parcel Motel, and they had everything I was looking for. 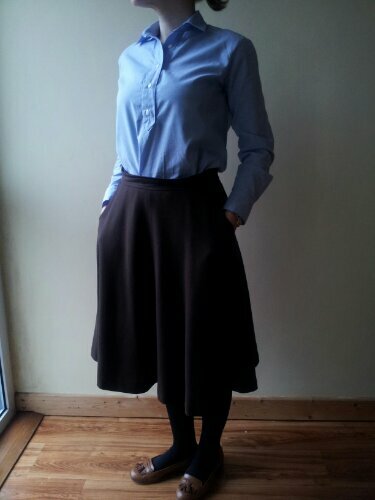 I ordered a number of things, including a black poplin which I have made up into a shirt for Alb. I hit a few roadblocks – I was hoping to finish it before September was out – so maybe you’ll see it next weekend. Speaking of fabric, I ‘inherited’ this rather fabulous suiting. There is a whole story to this so when I get started on it, I will share then. The red stripe isn’t nearly so conspicuous in person. I tend to gather a lot of vague ideas (see my Pinterest here), returning to them when I see something that triggers my memory. This is where these come in. The birds print is a cotton lawn from Murphy Sheehy’s that I saw quite a few months ago, noticed but ultimately passed over. Later in the summer, I was in Tommy Hilfiger on Grafton St (not because I ever shop there – I think I was waiting for something) and spotted this bird print shirt. I really rather liked it but there were maybe too many birds on it and it was €100+. 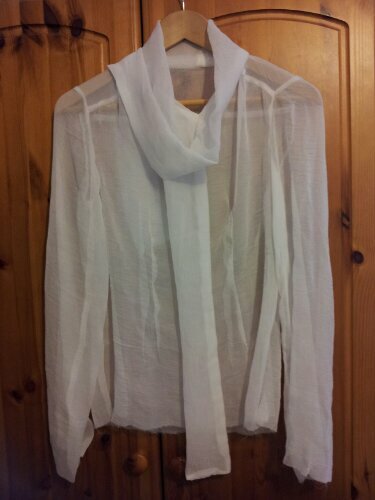 Fast forward to last Friday when I was browsing in Murphy Sheehy’s and at €12.50/m, enough for a shirt came home with me. As for the plaid, what can I say? I did not realise how picky I was about plaid, or even pickier about plaid flannel. Prompted by all sides, I started to consider various things like a flannel dress, or a tunic with shirt tails, or just a cotton plaid shirtdress. But the problem with flannel is that it can be very flannelly and I don’t want something that I will be constantly peeling off my tights or leggings. Add to this mix the popularity of really bright plaid at the moment – which is great, don’t get me wrong, just not for this imaginary dress. 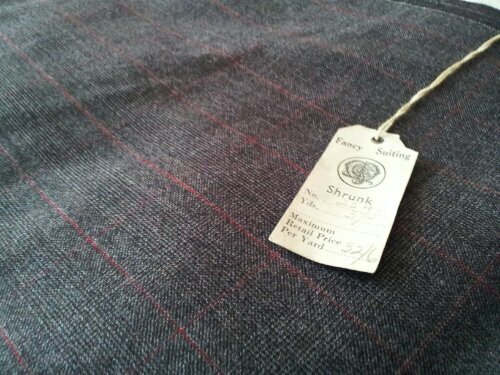 So, quite by chance I happened upon this soft cotton plaid in The Cloth Shop. It’s soft enough to be not a straight-forward cotton but not so fluffy to be an outright flannel. Win!